7 continents and 196 countries in the world and most of us do not even go out of our home countries our whole lives. Come and explore the world with us, a renowned name in the tourism industry of Vasai, Maharashtra. 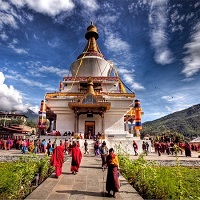 We offer Honeymoons, Romantic Holidays, Family Holidays, Beach Holidays, Group Holidays, Adventure Tours, Pilgrimage /Religious Tours, Heritage & Culture Tours, Wildlife Tours, Yoga & Ayurveda Tours, Golden Triangle Tours, Buddhist Pilgrimage Tours, and Eco Tourism for all over the world, especially Nepal and Bhutan at inexpensive rates. Contact us to find about the most suitable packages for you and your loved ones. If you do not find a package that matches the demands of your loved ones, let us create one for you!